And where there are middle schoolers, there’s a passion for carbs, meaning the inevitable vending machines. In this case, one for soda and one for candy. Hence, the first lines of this post. As you can imagine with that many kids craving caffeine and sugar, those two machines got a lot of use. 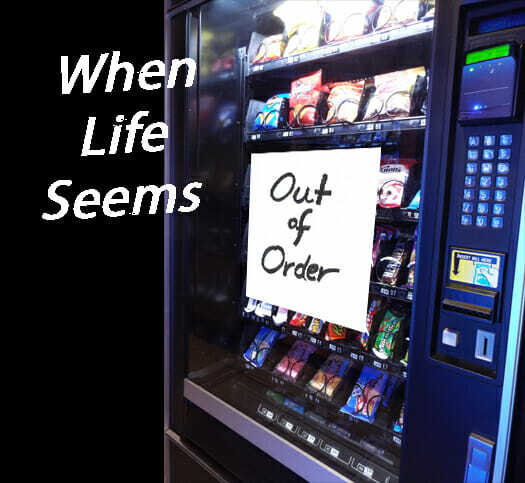 And if you’ve ever been around vending machines, you know. They break easily. Just when you want something from them the most. That evening, the stereotypical machines were being stereotypical, prompting lots of teenage frustration. As a chaperone—and a mother— I recommended they NOT waste their money. That the machine would just eat it. Me: Hey, guys, unfortunately the machine isn’t working right now. I think they figured if they didn’t acknowledge me, the problem would go away. Me: Seriously, if you put your money in, the machine will take it, and you’ll be left with nothing. Me: I know. But look. See how the packages are getting stuck in the metal coils? Them: That other kid got some. Me: Yes, but for every ten who use it, the machine only works ONCE—if you’re lucky. Them: We might be lucky. I admit. The “Mom look” came out here. You know which one I mean. Me: Listen. If you put your money in there, you cannot be upset if the machine doesn’t work. Me: You understand you will probably lose your money. Me: You will lose your money, and you won’t get any candy. Me: And I do not have any way of fixing it once you lose your money. I can’t get your money back. Me: All right. Don’t say I didn’t warn you. They put their money in. And the machine ate it. Them: Hey, we didn’t get our candy! I finally found some paper and taped up a sign. Out of Order. And they were mad at me because, in their eyes, I was punishing them. Suddenly I was the mean chaperone. As adults, we laugh. Roll our eyes. Make a joke about teenagers. But how often do I play their part with God? God: Don’t do that. It won’t work. Me: But I want it. God: It will hurt you. Maybe the discussion doesn’t even happen. Maybe some path looks completely reasonable, no wrong or right, no good or bad in question. But suddenly God blocks the way. The Out of Order sign goes up. Do I immediately assume He’s punishing me? That’s the question that made that moment on that field trip so poignant. If I wrote a post, it disappeared into cyberspace. If I created a graphic, the system would crash and corrupt the file. I couldn’t find anything I needed when I needed it. I felt like I wasn’t reaching anybody in the classroom. On my violin, my fingers couldn’t seem to hit the right notes. And even baking flopped. It was like someone hung a giant “Out of Order” sign on me. NOTHING I did worked—except reading my Bible. So I hunkered down, covering my head with verses to protect me from falling shoes. For months. I read chapters, books, over and over. Deuteronomy, Kings and Chronicles, Daniel, Isaiah, Zechariah, and Psalm 119. I know. As a title, it’s long. SEO would hate it. But the meaning was powerful. God spoke to me through His word in ways I’d never experienced before. Yet, while I appreciated the time resting in the verses, I was left questioning. What was wrong with me? Why did He think I needed humbling? It took me a year to figure it out. That night on the field trip, staring at my Out of Order sign on that machine, I realized it wasn’t punishment. All that spiritual warfare I was going through? It had the capability of pulling me away, turning me against God. Sending me to search for comfort, relief, “carbs;” throwing talents and money to a world that would gobble it up. How do I know it could have? Because it happened to a friend. A friend who was going through spiritual warfare of her own at the same time as I was. She’d mentioned it in passing, but I didn’t know the depth of hers because she seemed so strong, so confident, so graceful. I admit I envied her ability to let everything just roll off while she went about her business. For her, everything seemed to work. But just before that field trip, it all came out. She’d gambled, and she lost it all. Boy, if I thought the Lord had humbled me before, it had nothing on the humility I felt afterwards. While I sat chafing at my limitations, the Lord had protected me. From what I didn’t even know was out there. Why God pulled me to Him, throwing that Out of Order sign on everything I touched, forcing me to sit in His word—while my friend walked away? I will never know. At least this side of heaven. But I’m so thankful for the protection. Just like those kids, I could have tried to fight the machine on my own. Maybe with a prayer here and there for good measure. Instead, the Lord led me into the wilderness, humbling me, nourishing me with His bread: His word. Pulling me to rest in Him. To see His kindness through it all. He IS a good chaperone. The Best. This entry was posted in scattered kernels and tagged Deuteronomy 8:2, Protection--Not Punishment, When Life Seems 'Out of Order'. What a blessing, thank you for your honesty in telling it the way it is so many times and yes, the solution is always in Him through His Word. It would be great to share this. So meaningful. I 100% agree with you, Laura. “Having kids or students can’t help but remind us of God’s love…” He is so good to give us those analogies, isn’t He?